Monday 28th September 1914, Sharnbrook: An unfortunate accident took place on the railway near Sharnbrook Station this afternoon. P.C.Stringer of Harrold was on guard at the Girder Bridge when he was hit by a light engine on its way from Bedford to Wellingborough as he stood by the goods line. He was thrown down the embankment on to the passenger line and had to be taken to the County Hospital badly injured. 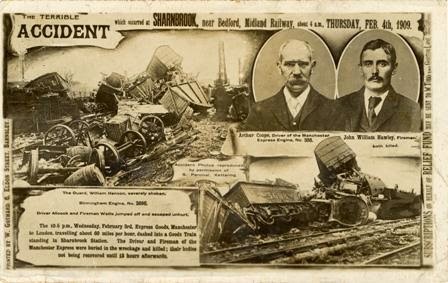 At least the accident was nowhere near as terrible as the dreadful disaster of 1909 - the express goods train from Manchester to London crashed into a stationary goods train at Sharnbrook Station and both the driver and fireman of the express were killed.